It was a great networking event. I guess loads of people got to know loads of other people. Many thanks to Sui Lin for organizing it. List of people who attended. To those who didn’t know, see below. Dont feel shy, just come! However, make sure you introduce yourself to us and also mingle around with other bloggers (friendsters invited as well!). Please dont sit at the corner and keep quiet! Nothing is gonna happen if you’re not proactive! www.xes.cx invites you to a gathering of bloggers (and non bloggers) @ Alexis Bar, Bengsar. A brain child of SuiLin.com, this gathering would serve as a great networking event. BABBLING BLOGGERS – A SUCCESS! 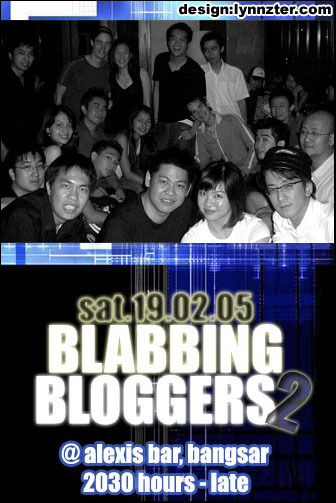 Babbling Bloggers was oh my god…So many people, about 70 (some say 100) people, 134 photos and 49mb of photos. Well, not everyone was a blogger. There were blogger’s friends and friends of friends. We even had representatives from Penang (Fon and gang). And not to mention those IRCers who came. Oh the madness. Initially we had a problem. 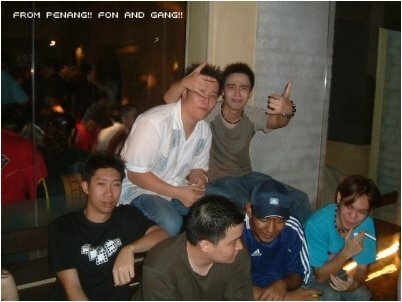 At 10PM, there were nobody except for ryuu, kim, paul, Sui Lin, Ben and others. Our booking was cancelled due to unforeseeable circumstances hence we had to resort to the tables outside. But since there weren’t many people yet, we decided to settle down on those 2 large tables. One hour later, oh my god, the benches were occupied. People had to resort to sitting on the table or stand up. Our corner was like a club, pack like sardines. Fuzzy said it took her half an hour to get in and out from our table. *snap *snap *get closer *smile people *flash *oooh this picture is bad take again! * were the usual lines of the night. Alcohol was abundant thanks to Sow and others for providing the booze. And thank you Sow for forcing people to drink and be merry. Anyway, newsflash, Gavin = total lost. Cris was fucked but still standing. Gavin was so drunk till he slept on the bench without realizing that someone was sitting next to him. Poor Jasmine had to move out. Well, tonight was a burst of social network for me. I got to know loads of new people and even caught up with some old friends. As for the others, I’m sure they met loads of new people hence it was worth a trip down to Bar Sa vanh. Thank you all for coming, the event won?t be as mad without your presence (I?m sorry I cant thank you all personally. Too many names!). And to those who Fong Fei Kei (who didn’t come), screw you guys! Ah no I’m just joking, it’s okay, Sui Lin said we should have it as a yearly event! Until next year, we shall meet again! All pictures @ Sui Lin’s website. For those I left out, sorry dudes..It’s 6AM in the morning..I’m tireed! Posted on January 31, 2004 April 2, 2009 Author xesCategories Babbling Bloggers25 Comments on BABBLING BLOGGERS – A SUCCESS! Babbling blogger in 2 days! 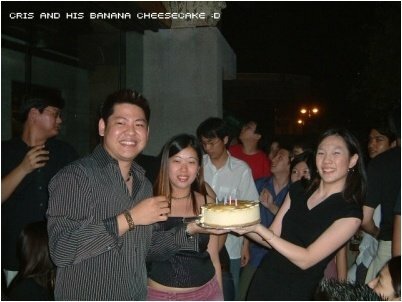 This event is also inconjunction with Cris’s birthday and Sui Lin and Gavin’s farewell party. So please buy Gavin, Sui Lin and Cris a drink 😀 Furthermore, we are not providing alcohol. This is not a party but a gathering. The amount of people that will turn up this Friday would be enormous. The list I made is incomplete. There are many more people whom I did not include and also, the friends of the people who are in my list are not included too. So, people, please come early to book a table. I doubt Bar Sa Vanh could fit all of us. P/S I added a section called “Worthy posts”. Any other posts to suggest? Posted on January 28, 2004 April 2, 2009 Author xesCategories Babbling Bloggers, General20 Comments on Babbling blogger in 2 days! 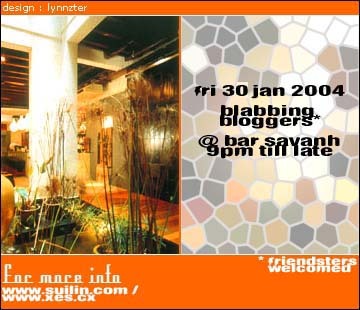 ATTN: 30th January 2004, Bar Sa Vanh TONIGHT!!!!!!!!!!!!!!!!!! Leave a note everybody..except Fish..
Here’s the list of people that are or might or might not go for the event.